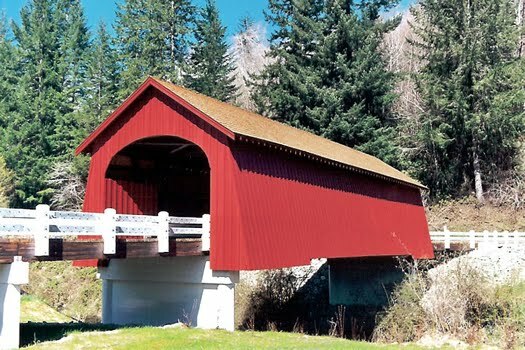 Did you know that Oregon has the largest collection of covered bridge in the West? There are 4 covered bridges south of us in Lincoln County! 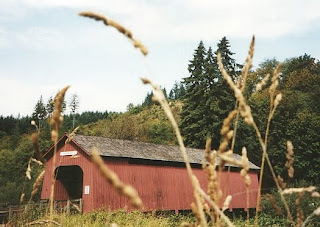 The heyday of covered bridge building in Oregon occurred between 1905 and 1925 when there were an estimated 450 covered bridges in the state. By 1977, this number had dwindled to 56. This focuses on covered bridges designed or built for vehicular traffic. Based on this criteria, Oregon currently has 50 covered bridges. The closest covered bridge to us here at Sandlake Country Inn is the Drift Creek Bridge. Originally, this covered bridge was erected over Drift Creek in 1914. After years of deterioration, the bridge was closed to even foot traffic. The area around the bridge was excavated in an effort to isolate the structure and limit access. This bridge was dismantled in late 1997. The County gave the timbers to the Sweitz family who owned land only eight miles to the north of the original site. Laura and Kerry Sweitz had envisioned the house being rebuilt over their concrete bridge that provides access to their property across Bear Creek. In the pioneer spirit that this bridge represents and through hardship and strife, their monumental efforts resulted in the resurrection of the bridge which now stands in a small, beautiful park-like setting. The Sweitz family has given the public easement for heritage purposes for all time. HOW TO GET THERE: From Sandlake Country Inn, travel south on http://www.blogger.com/post-create.g?blogID=4664414906864379493Hwy. 101 to Hwy. 18. Travel east on Hwy. 18 to milepost 3.96. Exit Hwy. 18 and travel south on Bear Creek Road 0.9 mile. The bridge is located on the left. Not much activity occurs at Chitwood anymore. The Chitwood Bridge was once surrounded by several stores, a post office, a telephone office, and several houses. The boarded up remains of the Smith store nearby is a dim reminder of the vitality the community once had. Logging in the area once boomed enough to support not only the stores, but also contributed to rowdy times in the Chitwood Dance Hall. In the early 1900s Chitwood became an important rail stop for the steam locomotives from Yaquina to Corvallis, as the town was where the engines took on water and fuel, as well as passengers and freight. The rails near the bridge are still used, but the train no longer stops at Chitwood. In 1982, Lincoln County officials announced that the bridge had been seriously damaged and would ether be replaced or repaired. A public hearing concerning the future of the bridge influenced the commissioners to completely rehabilitate the structure. Following environmental studies and engineering reports, a contract was awarded the following year to Aubrey Mountain Construction for the rehabilitation work. Supervision was provided by John Gilliland, who had helped build the covered Belknap Bridge in Lane County in 1966. By December 1983, work had been completed on the roofing, flooring, siding and approaches, costing in excess of $240,000. Dedication ceremonies in January 1986 included a recitation of history of the area and a parade of vintage cars. HOW TO GET THERE: From Highway 101, travel east from Newport on Highway 20, 17 miles to Chitwood. This 72 foot bridge once helped student make their way to Fisher School, which is no longer standing. 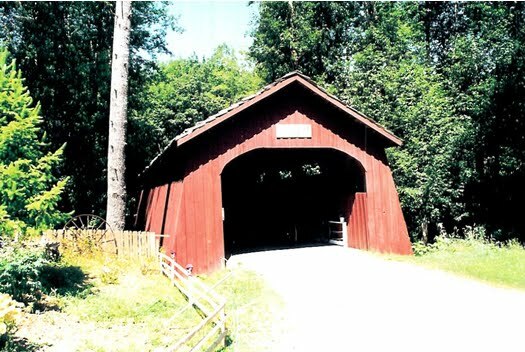 It was built by George Melvin, with help from local farmers and using Howe Trusses. Condemned in 1998, it was completely renovated and rebuilt by the Lincoln County Public Works Department., with help from the Oregon Department of Transportation and a federal transportation grant, and expertise by the Covered Bridge Society of Oregon. HOW TO GET THERE: From Waldport, drive east on Hwy 34. Turn south at Milepost 20 onto Five Rivers Rd. At milepost 9.4 turn east on Crab Creek Rd. The bridge is located a few hundred feet from the turnoff. 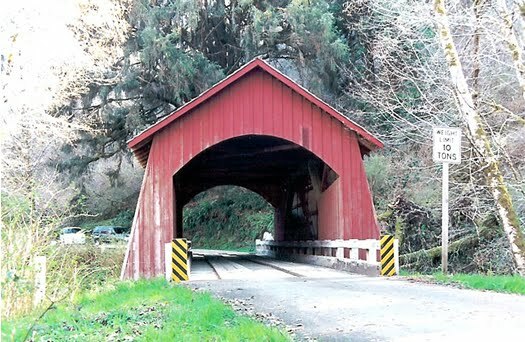 The rustic covered bridge spanning the North Fork of the Yachats cost the county only $1,500 when built in 1938, and was the last covered span constructed by veteran bridge builder Otis Hamer. Located just seven miles from the salt water of the Pacific Ocean, this trim little bridge is one of the few to escape the "graffiti artists" so common in many other covered bridges. Since the covered span is the only access for families in the area, the bridge roof was removed to allow a mobile home to cross in the early 1980s. In 1987, a loaded fuel truck crashed through a weakened approach on the bridge and the accident ruptured a fuel tank. Luckily, no fuel reached the river, and county crews soon repaired damage to the bridge. The bridge was rehabilitated in 1989 when work crews replaced the trusses and approaches. A new roof and siding were also added. A dedication in December 1989 officially re-opened the bridge to traffic. The engineer who designed the remodeling stated the bridge, with proper maintenance, should last another 50 years. The nearby community was established in 1880 as Ocean View, and was changed to Yachats in 1916 in salutation to a local tribe. The name "Yachats," according to the tribe, means "at the foot of the mountain," an appropriate nomenclature for both the bridge and the community. HOW TO GET THERE: From Yachats travel approximately 7 miles east on Yachats River Road to N Yachats River Road. At the intersection turn north and travel approximately 1.5 miles. The holiday season is here and we're all wondering what to buy for our loved ones. Think about a Sandlake Country Inn Gift Certificate! Give them a gift they can use any time to enjoy the beautiful Oregon coast. You can also click right here on the gift certificate picture. Don't worry about the security of putting your credit card info online, the company we use for our online reservations and gift certificates offers a very secure site. We look forward to making your loved one's stay memorable! On Saturday, November 27, Stimulus Espresso Cafe located in the Inn at Cape Kiwanda building in Pacific City will exhibit a new mixed media art exhibit by Michael Loney. The public is invited to see these works and meet the artist at an opening reception, 6:30 to 8:30pm at the cafe. Michael Loney, a lifelong Oregon resident, graduated from Milwaukie High School in 1969. Having been chosen "Most Artistic" by his classmates, Mike continued his art education at the Advertising Art Institute of Portland as well as the welcome tutelage of several renowned Oregon artists. For over thirty years, Mike has worked in several art mediums, including oils, watercolors and woodcarving, gaining the attention of many collectors of fine art. Originally inspired by the way Norman Rockwell portrayed everyday people, as well as the beauty of all of Oregon's wildlife, Mike has developed his own unique style characterized by his attention to detail. Click here to view some of Michael Loney's work. 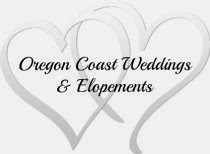 Admission is FREE for this Oregon coast event! A token amount is charged for the tastes. One of the first things most people think of ordering when on the Oregon Coast is chowder. Here's an opportunity to taste chowder and seafood by some of the best chefs in the Pacific Northwest. After tasting the delectable offerings, you'll be able to vote for your favorite. The awards are the People's Choice Award Best Clam Chowder and Best Seafood Chowder favorite. First, second and third place awards will be given in each catagory. Some of the participating restaurants include: Bay 839, Tidal Raves, Vivian's Restaurant, Ice Axe Grill, Fathoms, A Posto, Baked Alaska, Nelscott Cafe, Rogue Ales Public House & the Pelican Pub and Brewery.